If you are a commercial customer who needs temporary or intermittent access to water from our water networks, we have a range of options available for you. These options include tanker filling stations and hydrant standpipes. We want to ensure you receive the most appropriate service for your water needs. Please call us on 07 3432 2032 (8:30am - 4:30pm weekdays) to discuss your requirements and water supply options. Alternatively, you can email your requirements and contact details to meteredstandpipes@urbanutilities.com.au. What is a tanker filling station? A tanker filling station is a permanent outlet used to dispense water into a tanker or other portable water vessel. We have tanker filling stations located across our service area catering for commercial use. Where are tanker filling stations located? How do I operate a filling station? Commercial customers can use either a credit/debit card (Visa or Mastercard) or Smart Card (approval required) to obtain water from a filling station. All filling stations are fitted with both a 25mm male hose thread connection and a 75mm male camlock connection. Customers must supply their own filling hose at the filling stations. Full operating instructions are printed on the front of the stations. How much does water cost from a tanker filling station? Responsibility for the quality of water supplied from a tanker filling station transfers to the customer at the filling station outlet. What is a hydrant standpipe? A hydrant standpipe is a metered portable device used to obtain water directly from fire hydrants on water mains. Only approved commercial customers can access the water network using a hydrant standpipe. We offer a hydrant standpipe hiring service to approved customers. Standpipes can be hired for periods of one day to being on permanent hire. To discuss your hydrant standpipe hiring requirements, please call us on 07 3432 2032 (8.30am – 4.30pm weekdays). Training for standpipe operators is available from our approved training providers. Where can I use a hydrant standpipe? 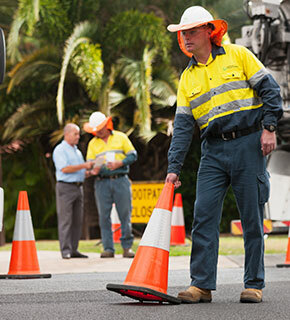 Approved hydrant standpipes can only be used in the Queensland Urban Utilities service area. Check that the suburb you are working is within our service area. If the suburb is not listed, you are not in our service area and will need to contact the relevant water service authority for your location. Our requirement is for customers to always use the tanker filling station network as the first tanker supply option. How much does water cost from a hydrant standpipe? Responsibility for the quality of water supplied from a hydrant standpipe transfers to the customer at the standpipe outlet. We have recently introduced an online facility for you to submit your monthly standpipe readings. The new facility allows you to simply log-on and enter your standpipe readings without the need to send us any other documents or images. To submit your readings, you will need your 8 digit customer reference number and your 8 character password. Your customer reference number can be found at the top right-hand side of your bill. Your password was provided to you when we wrote advising you about the new online facility. You can change your password at any time. If you can't locate your customer reference number or have forgotten your password, please call us on 07 3432 2032 and we will assist you. All standpipe readings must be submitted within 5 days of the end of each calendar month (late fees may apply). If you have difficulty submitting readings, please call us on 07 3432 2032. In 2015 we replaced our four ITag (water tag) filling stations in the Scenic Rim Regional Council area with new card operated stations, as part of our Tanker Filling Station Upgrade Project. Customers who still have an ITag can obtain a refund of any credit held on the tag and the tag deposit held by us, by completing a Water Tag Refund Claim Form. The claim form and pre-paid envelope can be obtained from Scenic Rim Regional Council Customer Service Centres or by calling us on 13 26 57 (7am - 7pm weekdays). Once we have received your tag and application, we will issue all refunds within 20 working days.